Chelsea star Eden Hazard has once again left the door open to a possible move to Real Madrid in the future, which will concern Blues fans. As noted by Marca, speculation of a move to the Bernabeu refuses to go away and it seems as though the Belgian is doing little to entirely dismiss those links. With the Spanish giants yet to fill the void left behind by Cristiano Ronaldo last summer following his switch to Juventus in terms of a marquee signing, that will arguably ensure that the Hazard links remain. Particularly if he continues to talk about the possibility of a move to Spain as noted below without fully committing himself to Chelsea, it will remain a source of real concern for the Premier League giants. “Why not? You know it very well. You’re asking the question, but you know what the answer will be so you don’t have to ask it,” he said when asked if he’d be happy to join Madrid, as quoted by Sky Sports via an interview with France Football. That also gives hope to Chelsea that he will remain as he is happy in west London, but it doesn’t get rid of the question marks entirely. On an individual level, the 28-year-old is having a great season. He’s bagged 12 goals and 10 assists in 28 appearances to show that he is a fundamental part in Maurizio Sarri’s system. 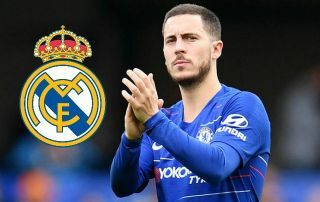 However, with Chelsea toiling and struggling to stay in the top four in the Premier League coupled with their participation in the Europa League this year, it may not be what is needed to convince Hazard to stay if Real Madrid do come knocking.